Again the same trembling indecision on the outbreak of the War in 1914. Ireland's attitude in this crisis was misunderstood in England with such ludicrous perversity that the Hibernians had little difficulty in persuading a guileless Parliament and public that it was certain incivilities of War Office officials towards Hibernian recruiting-sergeants that determined the failure of Mr. Redmond's war-policy. That was absurdly far from being the case. The true reason was that Mr. Redmond had no war-policy at all. Our own war programme may deserve praise or censure; it was, at all events, unambiguous. We proposed an Irish contribution—substantial, but conditional—to the armies of the Allies. The proposition we submitted to Mr. Redmond at the entreaty of his most influential supporters in Cork was that he should take the initiative in summoning a Conference of Irish Unionists and Nationalists for the purpose of jointly recruiting an Irish Army Corps with its reserves for service on the Continent, upon a guarantee, which we were in a position to assure him the Irish Unionists would gladly give for themselves, and insist upon from a Coalition Government, for an agreed Home Rule settlement on the basis of a United Ireland. The raising of an Irish Army Corps happened to be what was named by the Prime Minister himself as an adequate contingent from Ireland and in our judgment, stronger now than ever, would have been rewarded with everlasting gratitude from England if offered in that hour of her peril. The proposal was contemptuously thrown aside by the Hibernian leaders, without (as we now know) going through the formality of consulting their Party, and without advancing any clear-cut alternative of their own. But Mr. Redmond's famous War-speech, over which England almost wept for joy? The most foolish English member of Parliament who went into raptures over it then has only to read it now to know how absurdly he was hoaxed. It is not Mr. Redmond's sincerity that is impugned when he professed and truly felt fidelity to the Allies: it is that the titular leader of the Hibernians was never more than the subconscious instrument of two or three men, whose judgment he profoundly mistrusted, but to whose tortuous ways, since (by this time) they represented "majority rule," he was bound to conform. He met the war-crisis with that characteristic mixture of high vision and unfirm purpose which at the same time exalted and enfeebled his character. His speech in the House of Commons, delirious as was the effect of its eloquence upon English nerves, strained at the moment as they had, perhaps, never been before, in reality misled England and Ireland alike, wobbling as it did between what sounded like a vehement promise of an Irish Army for Flanders, and what it really was—some cryptic undertaking to "defend the shores of Ireland" against what danger he forbore to specify, but in language which Young Ireland interpreted as a hint to keep their arms for home service—for what precise service or against what foe, they were left to divine for themselves. The attempt to ride the two horses disastrously broke down. 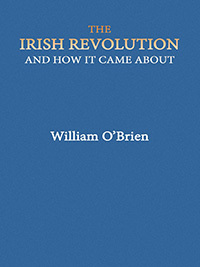 It only raised the young Republicans, now dimly showing themselves, in revolt against the double-dealing of the Hibernians, while in the direction of aiding the Allies it got no further than a half-hearted recruiting campaign to raise an "Irish Brigade" (the absurd misnomer bestowed on the 16th Division) which, after spending its Irish blood in rivers, without much thanks either in England or in Ireland, wound up by being obliged to see its depleted ranks eked out by English recruits. The sacrifices of at least half-a-million soldiers of Irish blood, scattered through the various Allied armies, were allowed to go without reward or notice—with, indeed, much revilement of their motherland,—while the hints of a counter-policy of "defending the shores of Ireland" threw most young Irishmen worth their salt into the Republican camps to "wait and see."